Tues. - Thurs. 11 a.m. - 10 p.m.
Fri. 11 a.m. - 11 p.m. Sat. 5 p.m. - 11 p.m.
We believe in transforming the ordinary into extraordinary through 5-Star service, luxury accommodations, and our commitment to culinary excellence. Established in 1882. 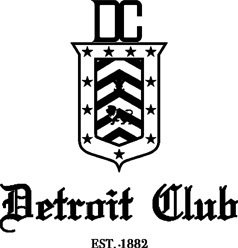 The Detroit Club has a rich history of being celebrated as the premier meeting place for some of the greatest business minds of our time. The meetings held behind these doors eventually led to a new age of industry, and held an integral part in launching our nation into the super power that it is today. These doors have opened once again to bring together the brightest and best minds that our great city has to offer.